Fulham Football Club, also known as â€˜The Cottagersâ€™, is considered to be the oldest professional team in London. 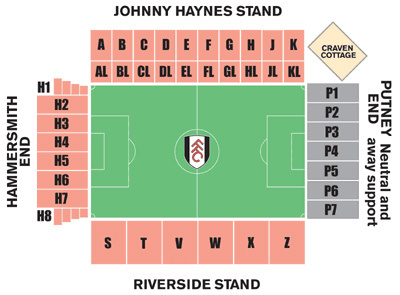 The club play in a black-and-white strip when home at their Thames-side ground, Craven Cottage, which has undergone dramatic expansion since Fulhamâ€™s purchase by tycoon Mohammad Al-Fayed. Fulham has a tradition of glamorous players like George Best, Bobby Moore and Johnny Haynes, and famous fans including Hugh Grant, Pierce Brosnan, Michael Jackson and Lily Allen. Manchester United are arguably the biggest football club on the planet. They are the richest, the most famous and certainly in their home country the most successful. They boast over 50 million fans around the world and regularly seat around 70,000 of them at the â€˜theatre of dreamsâ€™ at Old Trafford. Manchester United Football Club is an English football club, based at the Old Trafford stadium in Trafford, Greater Manchester.